You will stay in the historic centre of Florence, near Piazza S. Giovanni and the Duomo, dominated by the famous Cathedral Santa Maria del Fiore covered with marble of different colours, the bell-tower of Giotto and baptistery particularly renowned for its 3 bronze monumental portals. 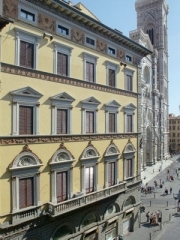 Recently renovated, Palazzo Gamba is composed of 12 apartments spread over 7 floors with a lift. Each dwelling is of good comfort and it is equipped with: TV satellite, telephone, intercom, air conditioning, heating system, hair dryer, safe and dishwasher. 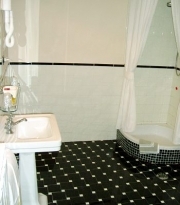 The decoration is particularly careful with antique and modern furniture. Shops, restaurants and supermarkets are nearby. The Santa Maria Novella train station is 800 m. away. It is possible, on request, a free cradle. The animals are not allowed. The three-roomed apartment (4 beds) of Palazzo Gamba (65 m2) is composed of living/dining room with kitchenette, 2 double rooms, 2 bathrooms with shower.